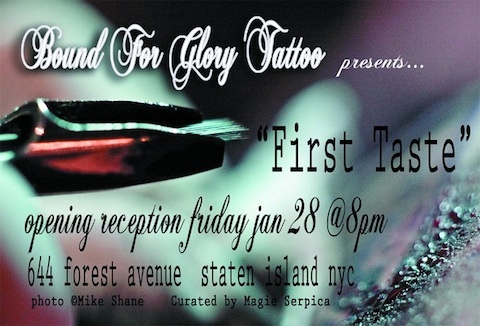 "First Taste" Art Show at Bound for Glory Tomorrow Night! In case you're wondering where I'll be on Friday night, the plan is for me to attend the opening of Bound for Glory's first art show. Now, I'm not a big fan of Staten Island (nothing against the people, just my least fave borough), but the fact that the show is curated by Friend of Tattoosday, Magie Serpica, makes it worth the effort. Magie originally appeared on Tattoosday here. This is our first art show at Bound For Glory! It will feature the art of many awesome local Staten Island artists, as well as select works from some tattooers nationwide. The art will be for sale and a portion of the proceeds will go towards Project Hospitality, a local charity which feeds the hungry, shelters the homeless and cares for people with HIV/AIDS. ...The opening reception will be on Friday Jan 28th at 8pm. There will be refreshments, which will be generously donated by local businesses such as Starbucks, Jeans Fine Wine & Spirits, and The CupCake Bar NYC. We will be selling raffle tickets for an awesome gift package including: a gift certificate from Comic Book Jones, Some T-Shirts from Robots Will Kill, & "An hour in the chair" with Magie Serpica! Assuming I can dig my sister's car out from under a new foot of snow by tomorrow evening, I plan to attend and report on it next week, with a photo or two, to boot. Hope to see you there! ...I got a clipper ship on my upper arm. The ship is navigating through a background of clouds and lightning bolts and has a banner underneath reading “Hope.” Its meaning follows the same idea behind my anchor tattoo. Hope is a huge part of having a positive mental attitude, which I try (sometimes with little luck, of course) to hold at all times. It’s a reminder that you can make it through stormy parts of your life, no matter how bad they get. It’s also done in the traditional style I love so much. The tattoo was done by Mike Schweigert at Electric Tattoo in Bradley Beach, NJ. While attending [the 2010] Philadelphia Tattoo Arts Convention, I decided to get a tattoo to commemorate my first convention. 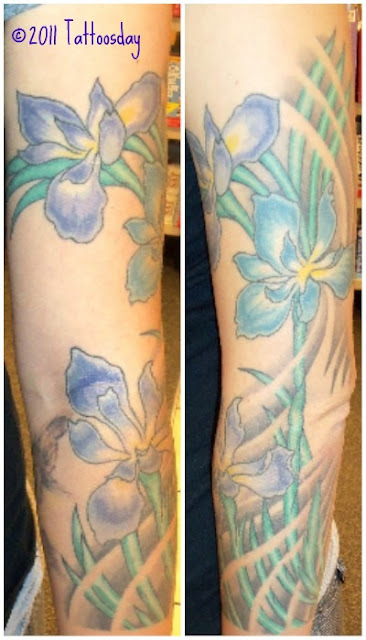 For as many years as tattoos have been a part of my life, this was my first convention...I got a blue rose with a candle spouting out of it in between my sparrows and flower on my outer elbow. I’m a firm believer in everyone having a different reasoning for getting tattoos. 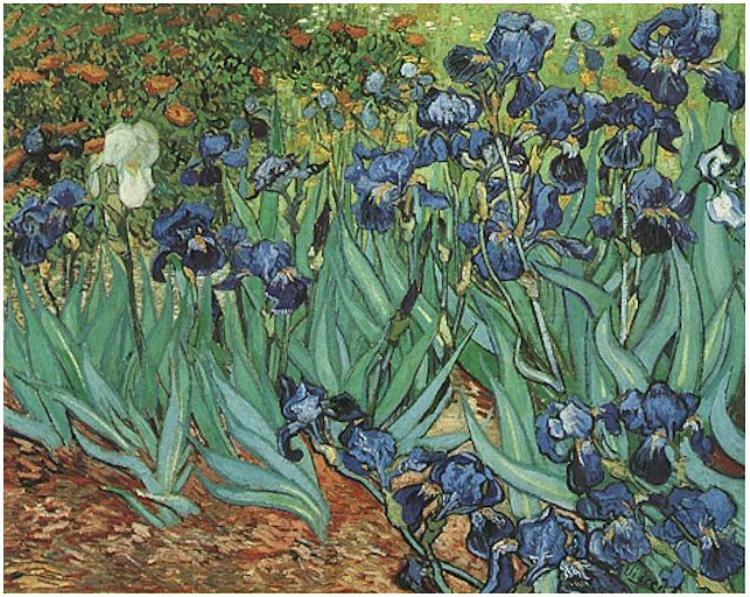 Some are used as place markers in one’s life, some are used to remember an event, some have deep profound meanings and some are just aesthetically pleasing. I could probably come up with some in depth meaning behind the tattoo, but in the end, I got it to commemorate my first tattoo convention and that’s pretty much the only reason. Done by Rocco at Death or Glory Tattoos in Westbrook, Maine. 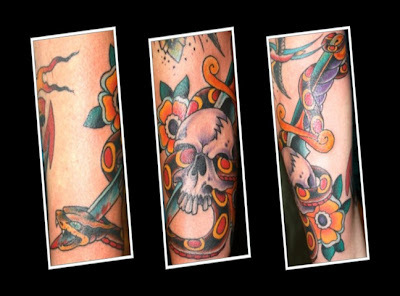 Finally, I got my outer elbow to forearm done with a snake coiling through a skull and dagger and impaling itself on the dagger’s blade. I usually try to go out of my way to ensure that my friends/family/other people in general are happy, more often than I would like to admit, putting their happiness before my well-being. This tattoo serves as a reminder for me not to do that so much, and to focus on myself sometimes. The snake can be viewed as a protection figure, coiling around and through the rest of the tattoo, but has also caused injury to itself by doing so. Basically, its my reminder that as much as I would like to help others, I need to keep my own happiness and well being in mind before I choose which action to take or I’ll end up injuring myself in the process. Done by Mike Schweigert at Electric Tattoo in Bradley Beach, NJ. 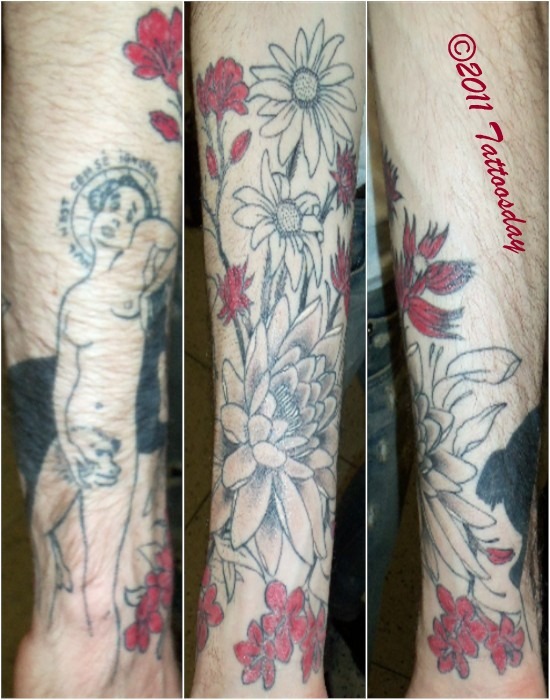 A hearty thanks to Sean for continuing to share his tattoos with us over the years! So winter makes me consider desperate measures. As I've trickled down to two or three posts a week (believe me, it hurts me more than it hurts you), I've occasionally toyed with the idea of reporting on other things in the tattoo community, other than the Bill-o-centric encounters I have in the City That Never Sleeps. I've even gone so far as to write a few posts and then never published them. The reality is, however, I am facing a scarcity of inkspotting occurrences, and I'm just going with the flow. And, finally, in a creepy news story, but one that certainly nipped at my curiosity, the artists at Sacred Art Tattoo Studio in Tucson are getting some publicity, as they had the dubious distinction of tattooing Jared Loughner last fall. Not to feed into the media frenzy surrounding this guy, but I was curious, so I just had to look into it. Read all about it here. So what do you think? Should Tattoosday Newsday becoming a regular feature? Feel free to comment below. 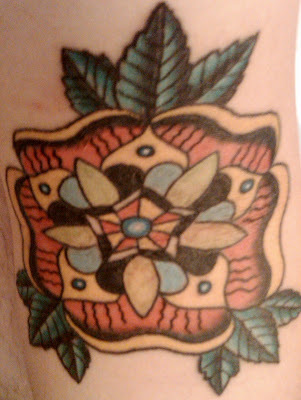 Last summer, my friend Paul had some new work done by Pierre at The Fort Apache Tattoo Studio near Penn Station. You can see some of his old work here and here and here and here (yes, he's a regular!). Fort Apache is up several flights of stairs, but it is conveniently close to my day job, which makes up for the aerobic ascension to the shop on 31st Street. These four symbols are petroglyphs from the Taíno culture in Puerto Rico. 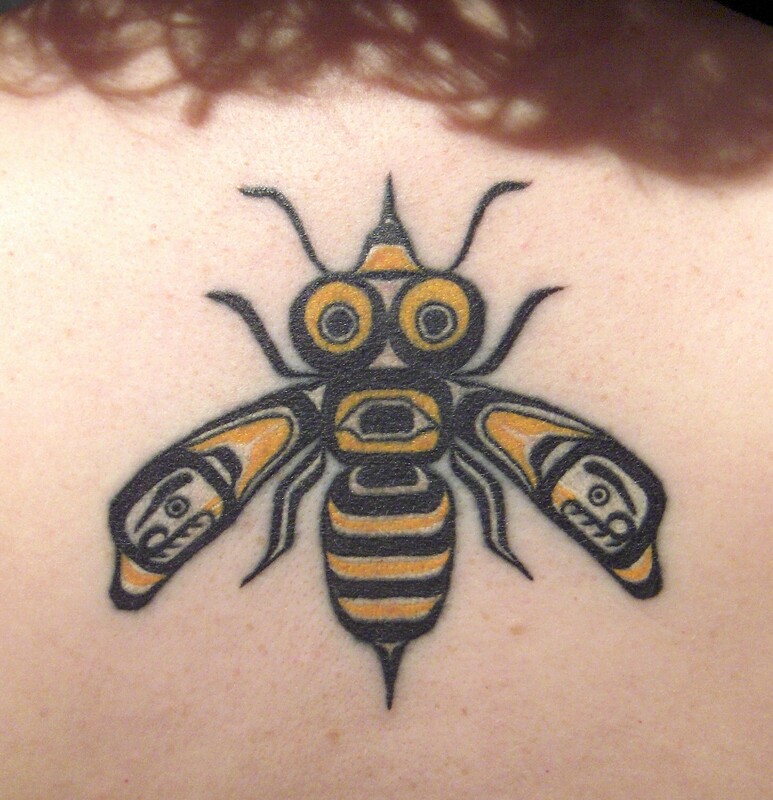 They are one way Paul has chosen to acknowledging his and his ancestors' culture, in ink. From top to bottom, the symbols each have literal meanings, and then personal meanings for Paul. 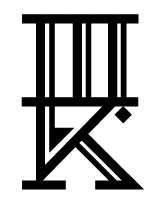 The triangular piece is a zemis, pointing in three directions - to the sky and the Creator, to the underworld and the realm of the dead, and to the world of the living. The second petroglyph is Sol, or the sun and the fourth design is the coqui, or frog. 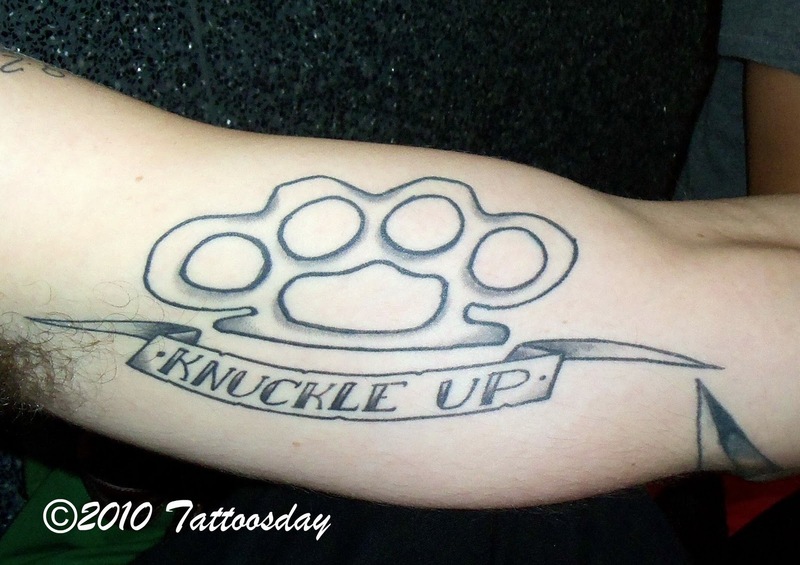 Thanks once again to Paul for sharing his latest installment of ink here with us on Tattoosday! Alas, with winter setting in, spotting tattoos in public is seasonably challenging. Thank goodness for ink on uncovered extremities, like hands and the occasional foot! 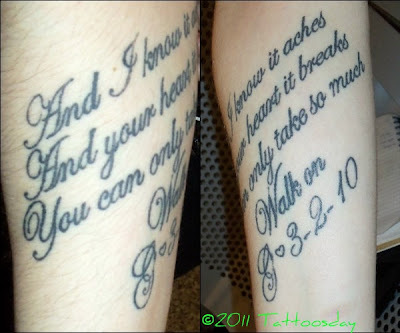 She had this, one of her three tattoos, done three or four years ago a couple of years after her father had passed away. It is a memorial that is based on a necklace her dad wore. When I asked her, after the fact, if she still had the necklace, she said she didn't, but said it was a lot like this one. She added "my dad bought it the Christmas before he passed away and it really showed off his sarcasm and style because he was very much into motorcycles and whatnot". 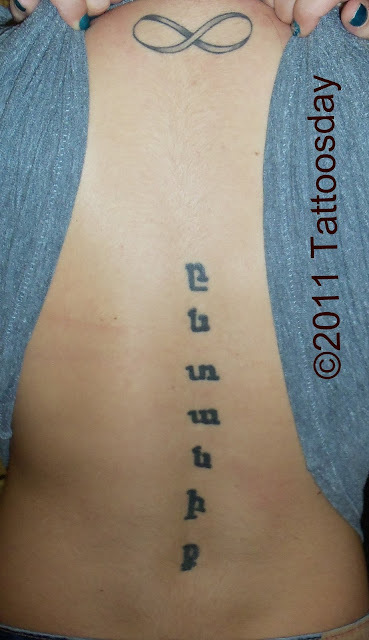 Wisely, in my opinion, she kept the design, but excised the words on the necklace from the tattoo! Niki had this done by Marc at Ink Link Tattoos & Piercings in West Palm Beach, Florida. 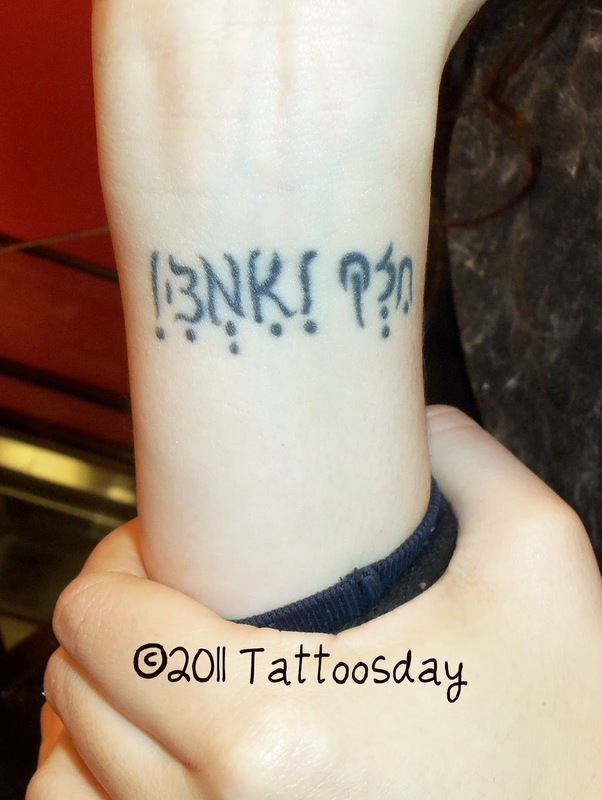 Thanks to Niki for sharing her tattoo with us here on Tattoosday! Back in 2009, one of our loyal readers, Sean, submitted a whole slew of his work for our viewing pleasure. You can read the original posts, here and here. Why do I bring this up now? Last summer, Sean sent us more of his tat-alog of work and I had been saving it for a rainy day. Since it's a rainy, sleety, snowy day, I thought I should share more of what Sean sent along. And since he sent a lot, I'm splitting it into two posts. What follows is the first installment. Italics represent direct quotes from Sean. I got the ditch of my elbow done probably about a year or so ago. It is a flower of sorts, of my own design, made up of various geometrical shapes. The tattoo represents two parts of our world, nature (the floral shape itself, petals, leaves, etc.) 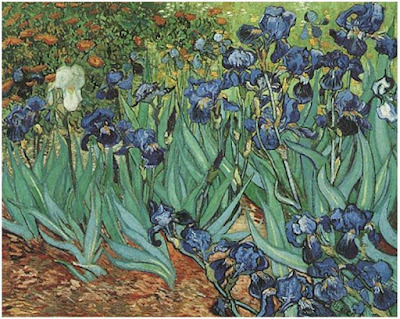 and science (the geometric shapes making up the flower). I believe that one should not base their ideals solely on nature or science/technology, but on a mixture of the two. It represents my appreciation for both nature and science. Basically, I am fascinated by technology and the sciences that are its basis, but at the same time do not feel that science should trump nature all together but rather, have the two working together in harmony. It was done by Robert “Binky” Ryan at Electric Tattoo in Bradley Beach, NJ. The sparrows circling my outer elbow were my next pieces done. I had attended a Marine museum in Philadelphia which had a great exhibit on the tattoo culture surrounding the Navy and sailors in general throughout history. According to the exhibit, sailors would earn the right to a single sparrow tattoo after traveling 5,000 miles at sea and a second sparrow after 10,000 miles. I am not much for sailing, but the idea of the sparrow representing travel and all the hardships, journeys, and successes that surround that travel appealed to me. 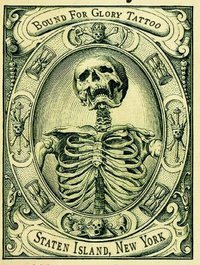 Further, I have a general appreciation for American Traditional tattoos and their overall aesthetics. These were done by Rich Heller at Electric Tattoo in Bradley Beach, NJ. 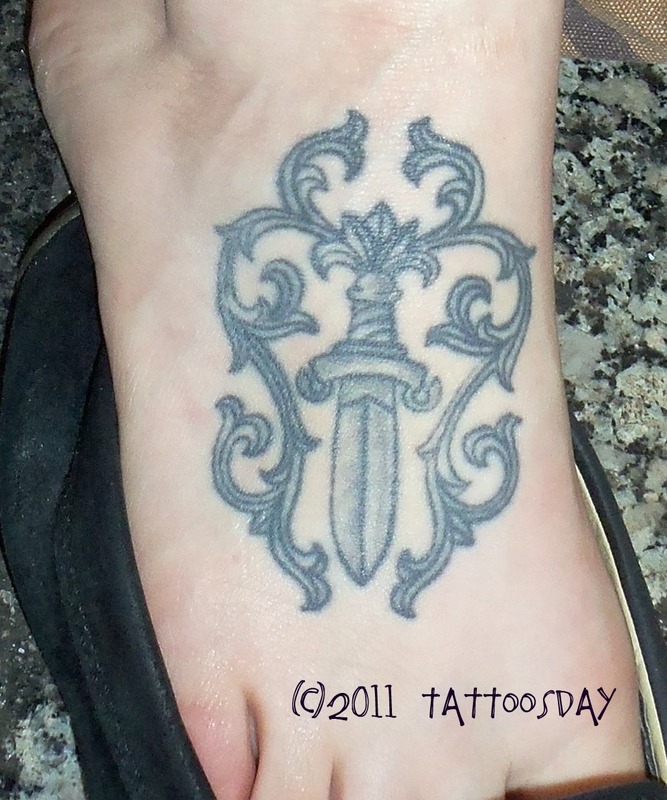 Don’t quite remember when I got my feet finished up, but it was sometime within the last year and a half or so. 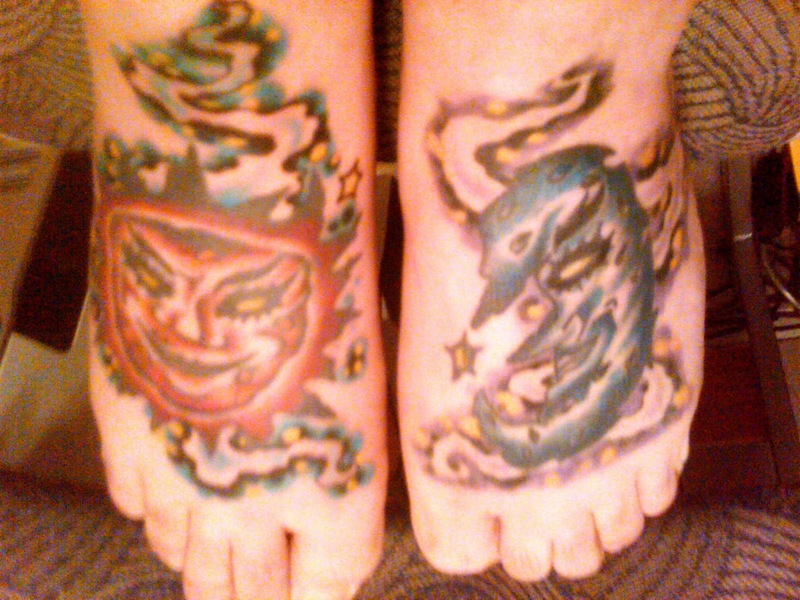 My feet are tattooed with a sun and moon, which I drew myself about 6 years ago. The duality of the sun and moon, and various meanings that these two symbols hold are why I had them tattooed. 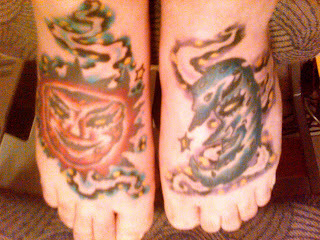 The idea that each represents night and day, or two opposites that work together to make up a whole, are what drew me to having the designs placed on my feet. Further, it represents the two sides that I have to myself, a lighter, happy, and caring side and a darker, selfish side. I feel a person cannot fully understand themselves without acknowledging and accepting all parts of their personalities. I also gave the sun and moon, a dark, kind of macabre, look as I am a huge horror fan and have always been attracted to the darker side of things. 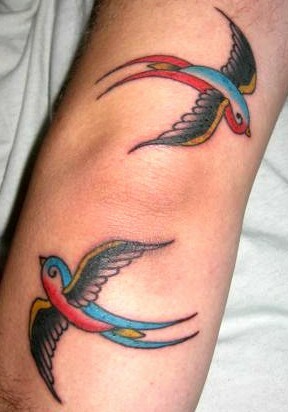 Originally, I had them inked by Robert “Binky” Ryan (then at Body Art World in Pt. 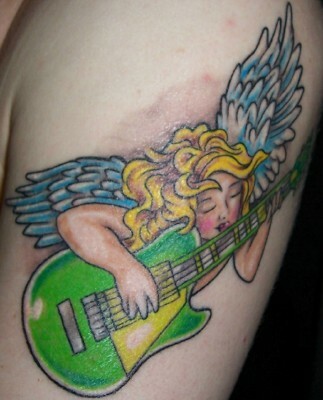 Pleasant, NJ but now Electric Tattoo in Bradley Beach, NJ) in 2004. They were done in grey wash and I was happy with them for about 5 years, in which point I decided to have them colored in, and had some background added. The color and background were added by Brody Longo at Slingin’ Ink in Pt. Pleasant Beach, NJ. The next piece I got was an anchor on my inner forearm. The anchor represents all the things that drag me down in life. 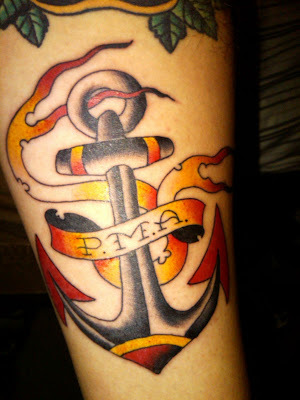 Across the anchor is a banner that reads “P.M.A.” the abbreviation for positive mental attitude. I feel the first step in pushing through any kind of hardship in life is to have a positive attitude, and the rest will follow. I want to say the original use of PMA was in a Bad Brains song, but I pulled it from its use in the Glassjaw song “Piano.” This tattoo is also a throwback to the band Glassjaw, as they have been my favorite band for I would have to say at least 10 years now and I have experienced just about every emotion possible while listening to their albums. So as an added bonus, the tattoo brings me back to all those memories. The tattoo was done by Rich Heller at Electric Tattoo in Bradley Beach, NJ. Thanks to Sean for sharing all of this with us here on Tattoosday, and for patiently waiting for me to post it! There are two significant elements to this work. Clark is originally from Utah, and he has chosen to acknowledge this in ink by having Utah wildflowers incorporated in the piece. The figure is bordered by the French phrase "Nul n'est censé ignorer" which can be translated as "ignorance is no excuse." The figure is based on the work of French painter and poet Francis Picabia. 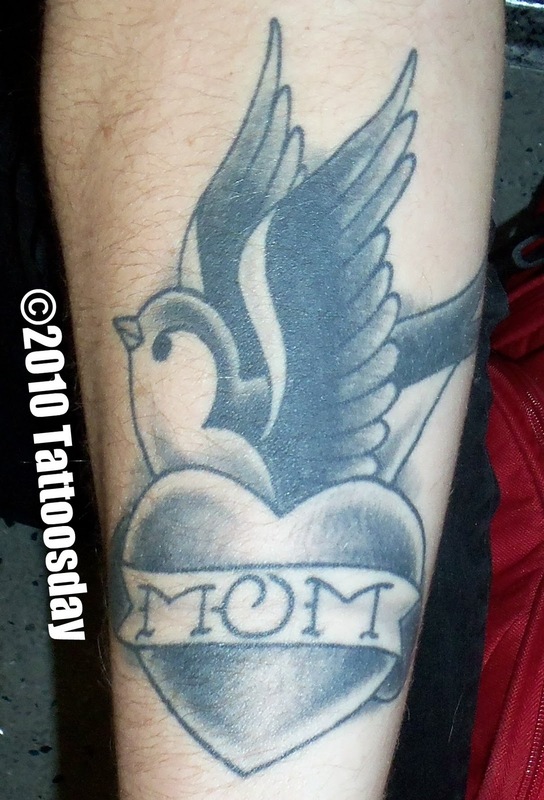 Clark credited both Jonah Ellis and Joss Macetti at Graceland Brooklyn for work on this tattoo. 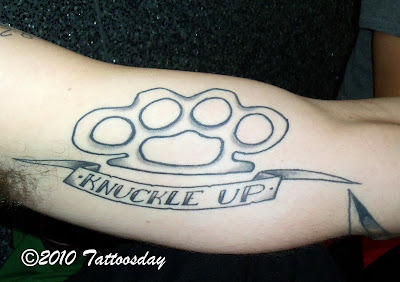 Thanks to Clark for sharing this with us here on Tattoosday! Well, folks, at one point I had over fifty days of material backlogged, but I've been rationing of late, and tattoobernating a bit. I've less than seven days of posts remaining and this cold weather has everyone hiding their ink because of the cold. So, until it heats up, check out this piece by writer Shonna Milliken Humphrey in tomorrow's New York Times. It's a very nice essay and it is ink-related. Celina explained that she had originally hoped to have this done in Aramaic, but that she and her artist couldn't find the proper script, so she chose this one instead. It's an old Hebrew script, which I can recognize a significant part of, thanks to my many years of Hebrew school in Hawai'i. is spoken by Moses, on behalf of God, addressing the Israelites after they have fled Egypt and are about to embark on the journey that takes forty years and eventually leads them to the Promised Land. 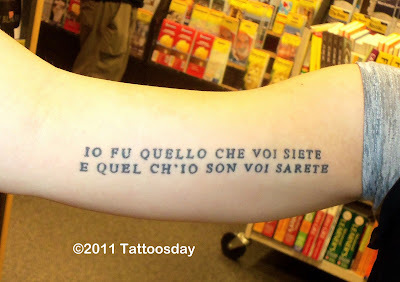 This phrase resonated with Celina, who had this tattoo done before she moved to New York from the San Francisco Bay area, and was about to embark on a journey into the unknown. She credited the artist Chris Evans, in Santa Cruz, California, with inking this tattoo. Thanks to Celina for sharing this tattoo with us here on Tattoosday! 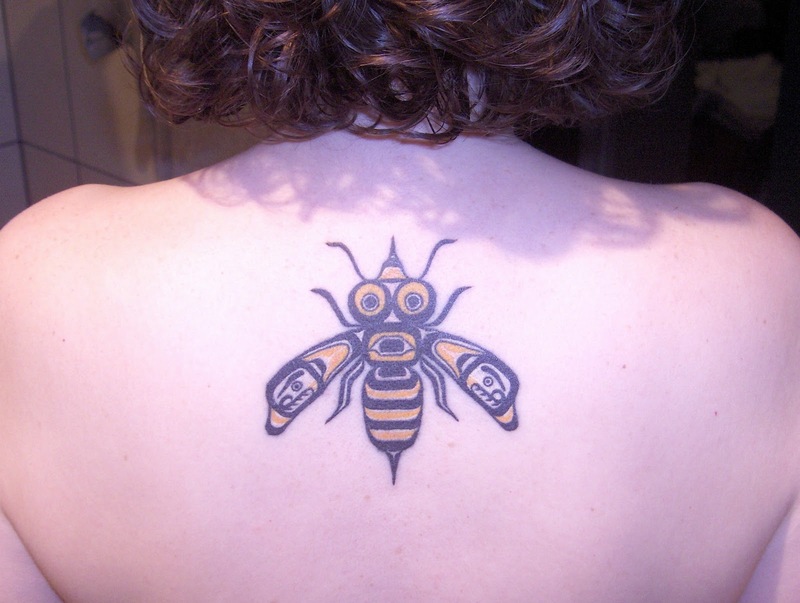 Among the several people who voted for my Thanksgiving tattoo last November, Jude sent along a photo of a tattoo she had recently received, on November 5, her first in fact. My married name is Beeman and next year will be our 20th anniversary. I had been searching for the perfect bee image for years. 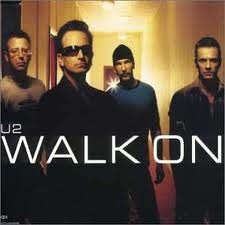 The image is by William Wasden Jr from Alert Bay, BC. I found the bee online, one of a series of prints. I found contact info for William, and both called and sent emails twice over a two month period. Unfortunately I did not hear from William. This due diligence did satisfy my tattoo artist, Shoko Sonoda, of Sumiya here in Vancouver and we proceeded with the work. The tattoo measures 4" by 4" which Shoko thought would be the smallest she would want to go to catch the details. The colours used are 'bee' yellow, black and white." Thanks so much to Jude for sharing this tattoo with us here at Tattoosday. It's really quite lovely! I met a trio of friends hanging out in Penn Station in early October, waiting for their train back to Rhode Island. I spotted Darius first, which was understandable, as he has seventeen tattoos. Kenny and Katie, his friends, each boasted a modest three tattoos apiece, and offered up theirs as well. He said that he and two other friends got the same tattoo. This was done by Jae Audette at Mcinnis Tattoo Company in Providence, Rhode Island. Work from the shop appeared previously on the site here. This was done by Forrest Curl at Altered Images Tattoo Studio in Cumberland, Rhode Island. This is a depiction of The Crimson King from Stephen King's Dark Tower Series. As you would imagine, Kenny is a huge fan. Rob Young is the artist who is working on this piece. Katie explained that her heritage is Armenian, and that the letters down her spine spell the word for "family". She added that two of her cousins have the same tattoo, but inked on their arms. She also noted that the infinity symbol at the base of her neck speaks to the Armenian text and symbolizes, for her, "family forever". She did not recall the name of the shop where she had this done, but recalled it was on Long Island, New York, and that the artist was "Joey D". 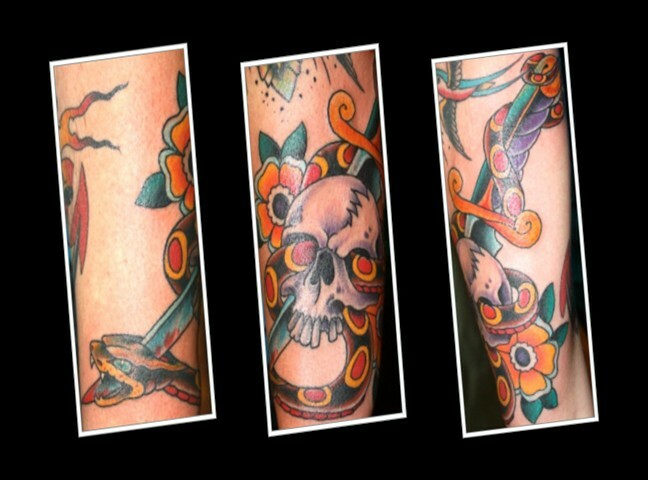 Thanks to Darius, Kenny and Katie for sharing their tattoos with us here on Tattoosday!